I love my day gig, but sometimes I just need to indulge in creative design projects. I enjoy the craftsmanship of design. I also enjoy helping clients bring their ideas to life and there’s something special about creating something new everyday. However, there are times when I need to do something creative in a whole other direction. It’s nice to break away from the computer and just to do a project for myself. It really helps free up your mind and allows you to look at something in a new light and reignite your creativity. The break is also refreshing when you get back into the grind. Creative design projects do not have to be just for creators. They can be for anyone and it can be anything you want it to be. It’s more about the experience of just getting away from the old routine and enjoying the distraction. Work will always be there when you get back. Trust me. You don’t have to be a master. You don’t even have to share your creative design projects. It’s all about play and channeling your inner child, tapping into the right side of your brain and getting lost for awhile. Projects like this clear your mind and help you recharge for future assignments. Nowadays everything is shareable. Everything from what you had for breakfast this morning to a work promotion, is displayed on a public stage. If you’ve done something, you have this feeling that someone needs to see it especially as a creator or entrepreneur. This is all great and needed, but when was the last time you did something just for yourself, not worried about how many likes it would get? Create just for the sake of creating. This involves no judgement or restrictions from yourself or others. When designing something for a client, we carefully follow instructions and stay within the parameters of that person’s vision. It’s creative confinement to some degree. The same goes with creating something to share on social media. You create something with your target audience in mind. You ask yourself, “will they like it? will it sell?” It becomes biased art. When creating for yourself, there’s no room for second opinions or criticism. It becomes the purest reflection of who you are as an artist. You may be thinking, ‘I don’t have time for this! I’m already bogged down with assignments.’ Why is creating good for productivity? Creating just for the sake of it helps us get out of a funk or rut. Getting away from a major challenge and doing something different really gets your head clear and allows you to see and solve a conflict in a new way. It also allows you to turn the brain off for a while and focus less on the stress of your daily routine. It’s something you can get lost in and drop the adult responsibilities… even if it is just for a while. Here is an example of a project I did just for myself. Stumpy. Not worrying about how many likes it would get or what would even become of it. Then over time, I started to see that the idea might have some legs. This project ended up being the jumping off point for my collection, Positively Ironic. I used Super Sculpy to model the character. 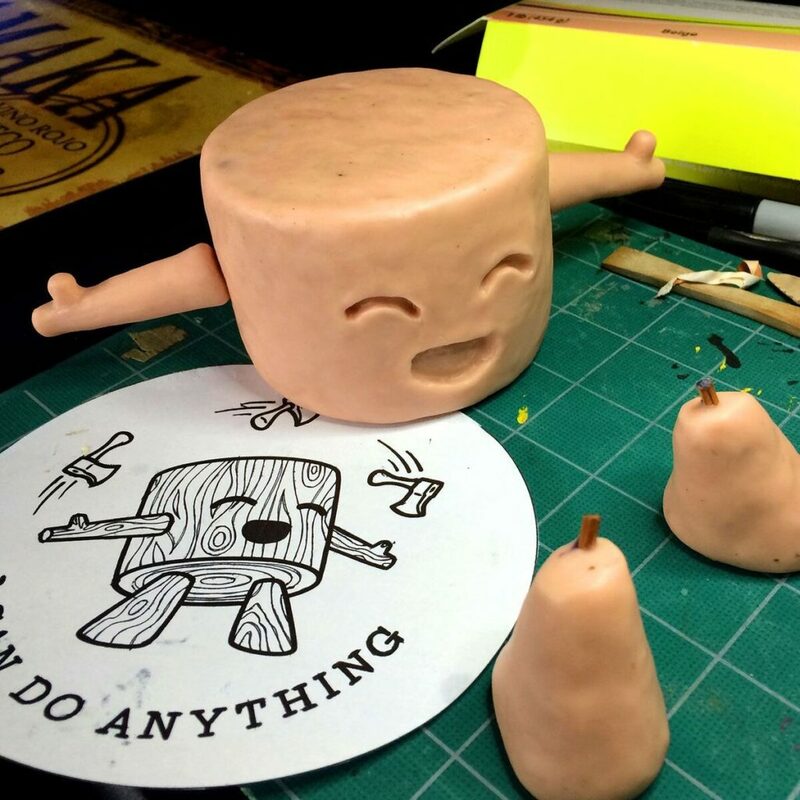 Super Sculpy is your friend! Easy to use and you can bake it in your conventional oven. It’s a strange beige color, super flexible and easy to work with. 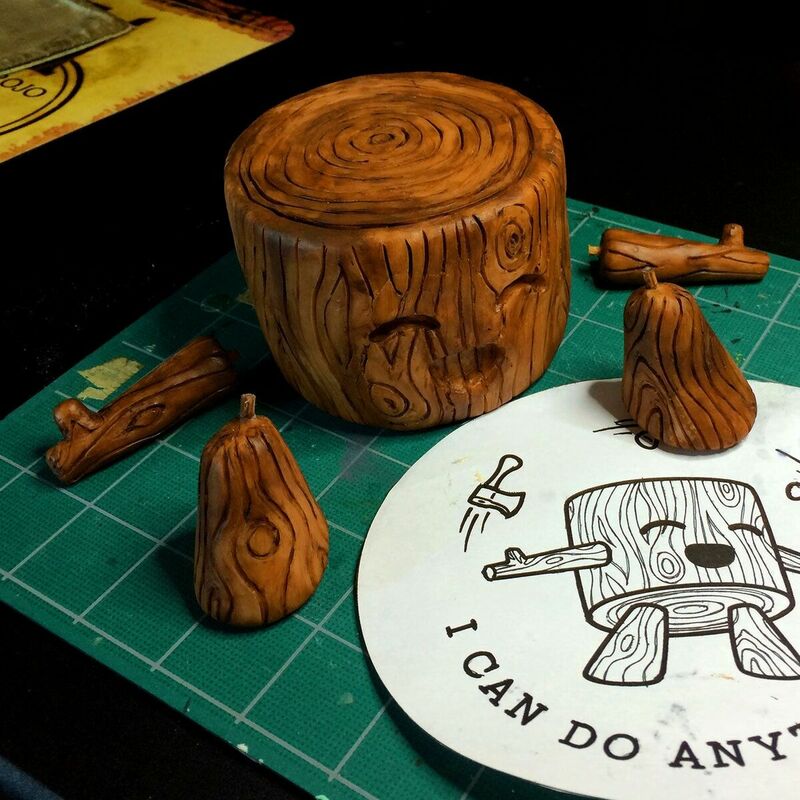 This is what I used to create old man Stumpy. First you got to get all the tools and materials lined up ready to go. 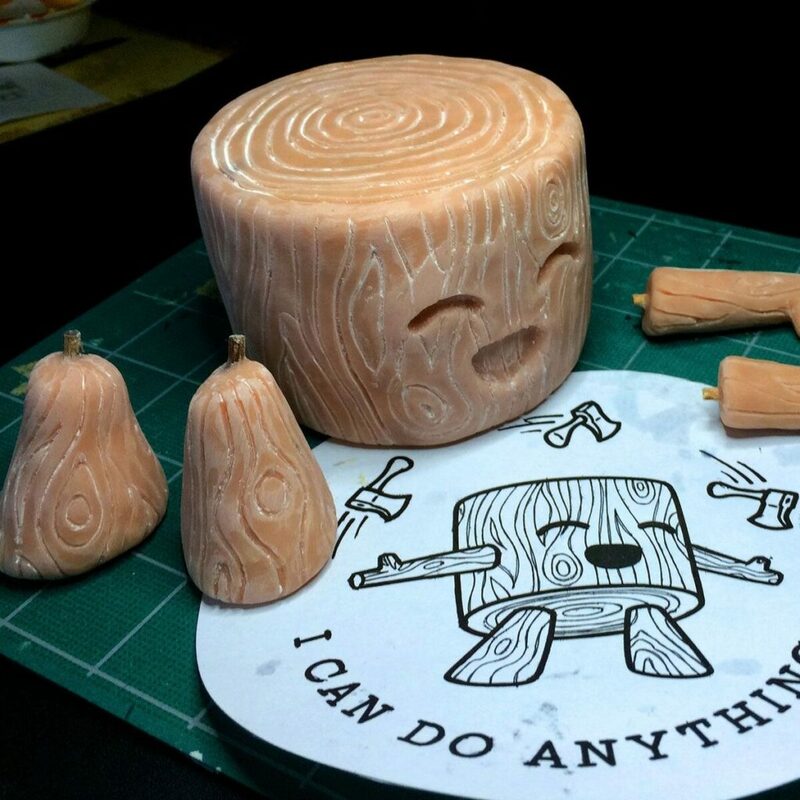 I found an old empty candle holder that was a good shape to create his body, wooden skewers for the arms and legs and then started to line everything up to model the character. In this phase, you’ll really start to feel like a kid again. It’s like the old school Play-dough days. I started out rough, just adding the basic form and then start to apply the details like the eyes mouth and even cut in the woodgrain. Once the model is ready, you can throw it into the oven to make it solid. Super Sculpty is also flexible once you bake it and harden it. You can now file down rough edges or even drill into it if you want to. But it is still very sturdy. Now it’s time to start adding the paint. I started with a light base color and slowly built up the darker colors to accent the wood grain and the eyes and mouth. Okay, now to put Humpty Stumpy back together again. I sanded down the connection pieces and put everything together with some good old superglue. 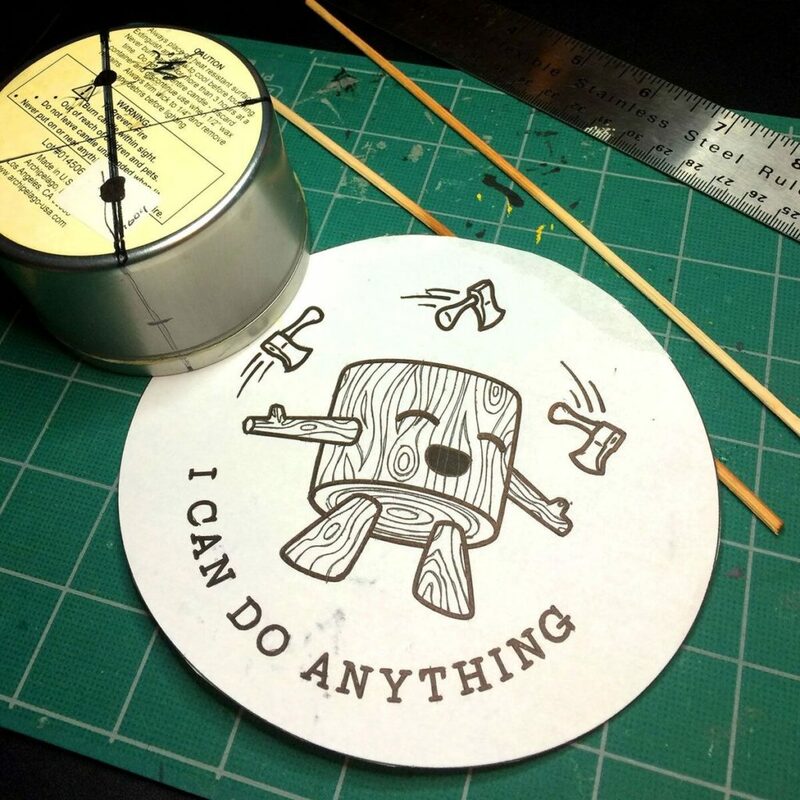 Of course it is not complete without a wood platform and some wood burning messaging to finish it off. Finished! 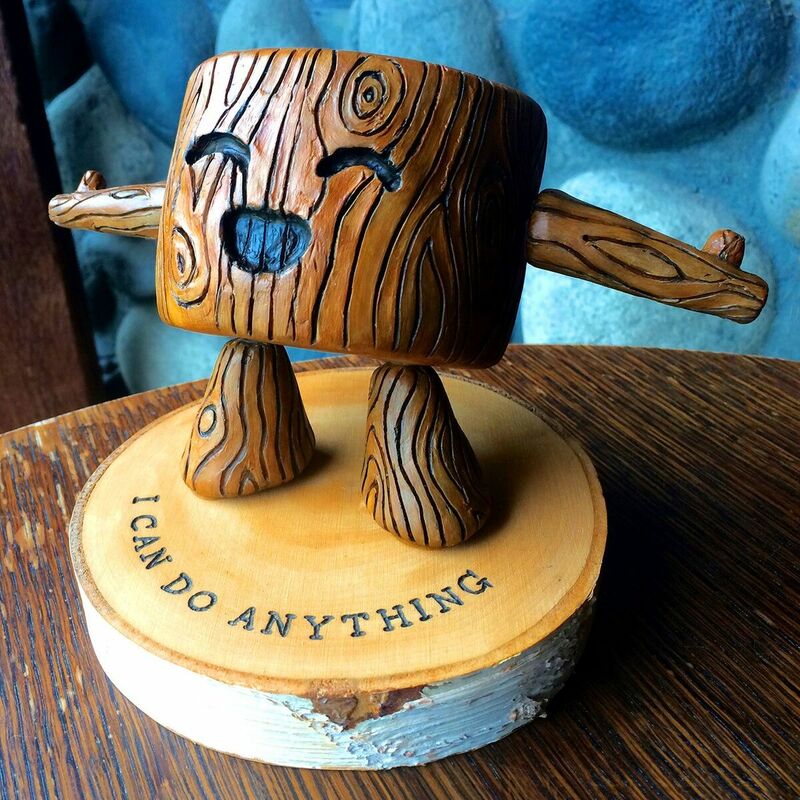 Long live Stumpy! So when you feel like you are in a rut or just need to be a kid again grab something and create again. Doesn’t matter what it is as long as it makes you happy and stretch your creativity a bit and gets away from the daily grind. Post your creative design projects below! I would love to see it.